Chief rabbi of St. Petersburg, Russia; born of an old-established family at Mohilev on the Dnieper in 1844. When only a boy he devoted himself to the study of the Talmud and of Jewish literature, attending the best Jewish schools of the time. He also received instruction in the Cabala from several Ḥasidic rabbis. Having graduated as rabbi from the rabbinical institute at Wilna, he acted as teacher there for some time. 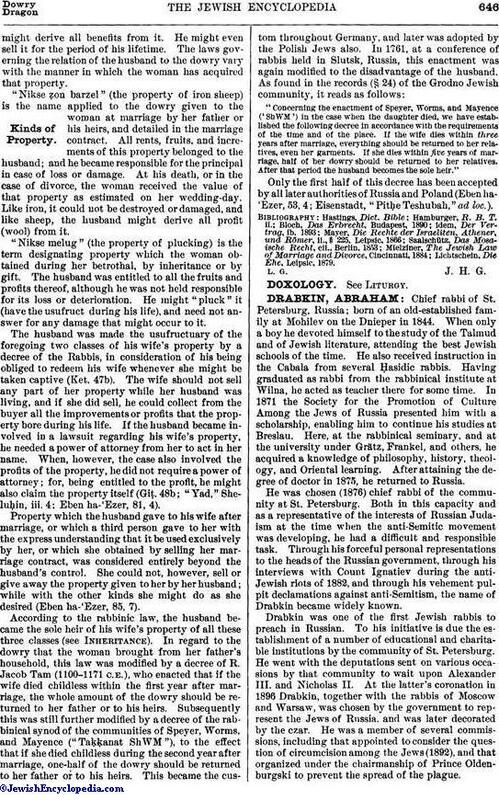 In 1871 the Society for the Promotion of Culture Among the Jews of Russia presented him with a scholarship, enabling him to continue his studies at Breslau. Here, at the rabbinical seminary, and at the university under Grätz, Frankel, and others, he acquired a knowledge of philosophy, history, theology, and Oriental learning. After attaining the degree of doctor in 1875, he returned to Russia. He was chosen (1876) chief rabbi of the community at St. Petersburg. Both in this capacity and as a representative of the interests of Russian Judaism at the time when the anti-Semitic movement was developing, he had a difficult and responsible task. Through his forceful personal representations to the heads of the Russian government, through his interviews with Count Ignatiev during the anti-Jewish riots of 1882, and through his vehement pulpit declamations against anti-Semitism, the name of Drabkin became widely known. 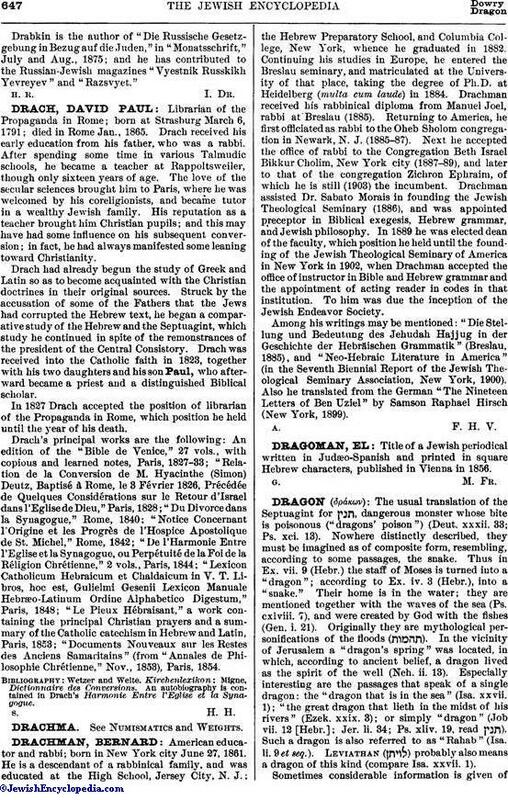 Drabkin was one of the first Jewish rabbis to preach in Russian. To his initiative is due the establishment of a number of educational and charitable institutions by the community of St. Petersburg. He went with the deputations sent on various occasions by that community to wait upon Alexander III. and Nicholas II. At the latter's coronation in 1896 Drabkin, together with the rabbis of Moscow and Warsaw, was chosen by the government to represent the Jews of Russia and was later decorated by the czar. He was a member of several commissions, including that appointed to consider the question of circumcision among the Jews (1892), and that organized under the chairmanship of Prince Oldenburgski to prevent the spread of the plague. Drabkin is the author of "Die Russische Gesetzgebung in Bezug auf die Juden," in "Monatsschrift," July and Aug., 1875; and he has contributed to the Russian-Jewish magazines "Vyestnik Russkikh Yevreyev" and "Razsvyet."